Commonwealth is an 18 hole championship course located in the heart of Melbourne’s Sandbelt. 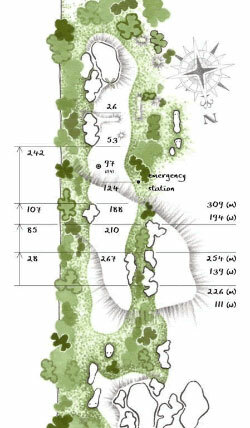 The Par 73 course has an ACR of 74 and measures a challenging 6380 from the blue markers. From the men’s white markers and women’s red markers the course measures 6000m and 5400m respectively. Commonwealth is revered for its challenging driving holes and subtle sloping greens which call for accurate shot making when playing from the fairway and its varying and attractive layout rewards careful positioning and well thought out play from tee to green. 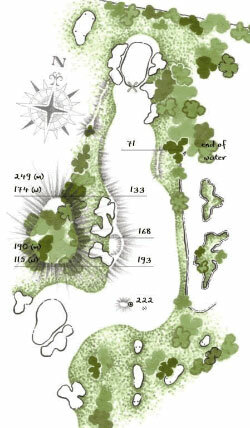 With four Par 5’s, three Par 3’s and 11 Par 4’s, the course remains a challenge for golfers of all abilities. Along with its spectacular bunkering and tree lined fairways, Commonwealth also features a lake, in play on both the 3rd and 16th holes, which is a rare attribute amongst the Melbourne Sandbelt courses. Click on the video below to take a tour of all 18 holes or scroll to the individual holes below to view the hole summary. An easy start and a definite birdie opportunity. Depending upon the pin position a long iron or a rescue club will be enough to set up a wedge to a large green which slopes from back to front and is very receptive. A back right pin demands a tee shot just short of the ‘straight ahead’ fairway bunkers for the best angle to the green. 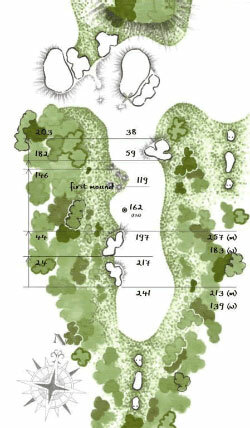 Long hitters may drive the green in favourable conditions however the risks outweigh the benefits. The view from the tee sets the scene for the typical Commonwealth tree-lined hole. A driver followed by a three wood should leave most players with a pitch of less than 50 metres to the green. The only issue with the tee shot is avoiding the fairway bunkers on the LHS which range from 213 to 257 metres from the tee. 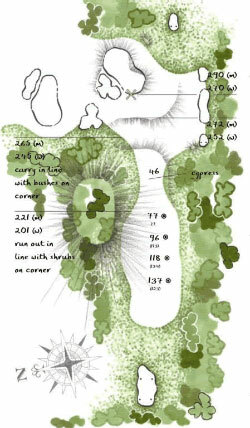 The three wood second shot needs to be played to the left side of the hole for the best angle into a difficult sloping green, but at the same time avoiding the fairway bunker 50m short of the green. The narrow and strategically shaped green is well protected by front green side bunker and presents a very testing approach shot. Another birdie opportunity for the player who can set up a good angle into the pin. A testing hole where par is a good score. 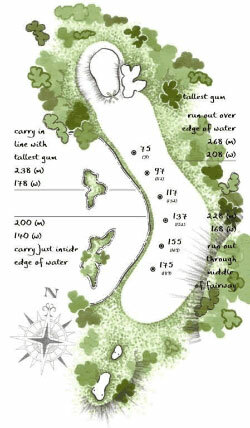 A long par 4 which is played along a generous fairway that is bunkered left and slopes towards the lake on the right. Fairway bunkers on the left range from 197 to 267 metres from the tee. A driver played well left of centre but avoiding the bunkers will run down the slope to the centre of the fairway gaining extra distance, after which a mid to long iron will be required to reach a long, narrow green with a pronounced slope from right to left. Shots to this green from the right hand side of the fairway must be faded into the pin (or be very precise) or they have an unhappy knack of running into the left hand greenside bunkers. A classic Sandbelt short par 4 which bends to the right and where the best angle into the green is obtained from a tee shot played directly over the fairway bunker on the corner of the dogleg and finishing on the right hand side of the fairway. With a shot of 175 metres required to clear the bunker from the white tee, a long iron or a rescue club is all that is required for the perfect position and a shot of around 130 metres to the centre of the green. The green slopes from left to right and a shot from the wide open spaces of the left hand side of this fairway will often run off the right hand side of this sloping green. A shot from the left hand side also brings the front greenside bunker into play and an “up and down” from this bunker is extremely difficult for anything other than a back centre pin placement. Picturesque from the elevated tee, this tree-lined hole rewards those who can finish close to the right side fairway bunker. The best angle into the green will be obtained by playing a driver close to the fairway bunker on the right (236-260 metres from the tee) leaving a mid iron to the centre of the green. This drive position is less critical for a short pin but is important for the classic left rear pin placement. 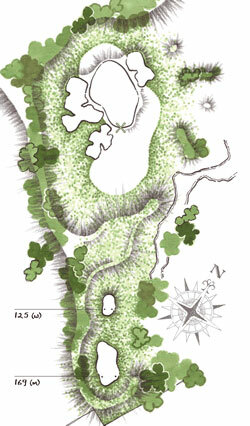 The relatively long (34 metres) green runs uphill to a tranverse ridge running across the middle of the green and then slopes away at the rear. Any miscalculation playing to a back pin and the ball will run off the back edge, and a long putt over the central ridge can be a severe test of touch and control. At 531 metres, this genuine three-shot par 5 is considered one of Melbourne’s best and hardest, particularly into a southerly wind. A driver avoiding the right hand fairway bunker (226 -254 metres from the tee) will present the player with a three wood second shot which must be played to the right hand side of the fairway for a short iron pitch with the best angle of approach. The relatively narrow green slopes quite steeply from back to front and from left to right and can be difficult to hit and hold from the left hand side of the fairway. The steep slope of the green makes the greenside bunker on the left a “no go area” and a player who is short-sided in this bunker is presented with one of the more difficult shots on the course. Played from the right angle this hole can be another birdie opportunity but get out of position and it is easy to have a six or more. 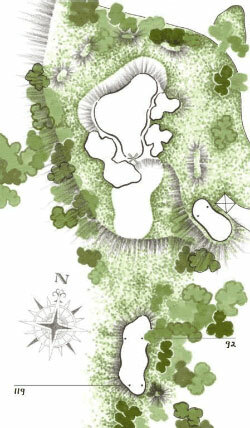 The longest of the par 3s has a generous green heavily bunkered left. This testing par 3 requires an accurate mid to long iron to a generous but sloping green protected by a large bunker on the left. The safest line is to aim to the right side of the green, taking the greenside bunkers out of play but which often leaves a long difficult putt with the pin cut back and left. Three is always a very good score on this hole. Many club members consider this hole one of their favourites, playing into an elevated green which is framed by the clubhouse. A driver to the left centre of the fairway avoiding the left side fairway bunker (206-237 metres from the white tee) will set up the best line for a mid-iron to this relatively long (34 metres) green which slopes from back to front and from left to right. 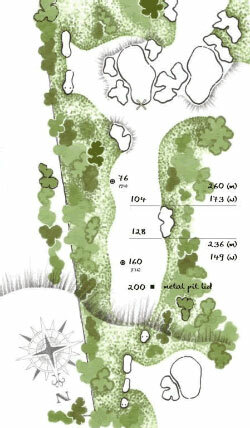 A tough hole where the ability to fade the ball into a back pin placement will take the bunkers out of play. The steep slopes of this green can make a long putt a very difficult proposition and four is always a good score. One of the great Sandbelt short holes. The epitome of a strategic par three which requires no more than an easy seven iron to reach the centre of the green – and that is fine when the pin is in the middle. 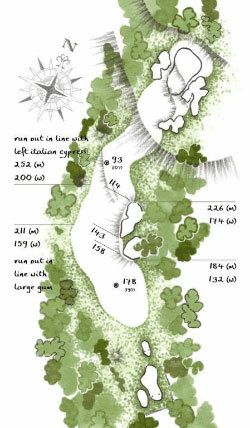 More common pin placements, however, are short left-centre – just over the front bunker, and back right or back centre. Pin placement determines the club and shot required and it is important to get the tee shot as close to the pin as possible because a long putt on this severely sloping green can be fraught with difficulty. A poorly executed attempt to get close to the pin, however, will often lead to a bogey. 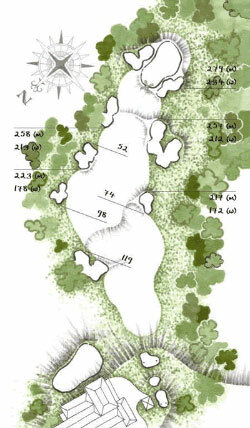 Land too close to the left edge and the ball will run off the green and down the steeply sloping surrounds; overshoot and the next shot is a very difficult downhill, breaking chip; and the player short-sided in the right hand green side bunker will more often than not walk away with a four. The green is situated at the highest point on the property and ball flight can be significantly influenced by wind which may not be noticeable on the relatively sheltered tee. 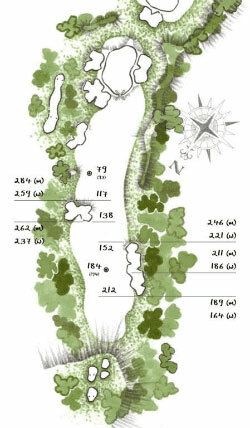 On this dog leg par 5 it is important to get the tee shot on the fairway. A driver played on a line close to the corner of the dogleg will set up a three wood shot which should be played to the right of the fairway to leave a pitch of less than 50 metres and another birdie opportunity. 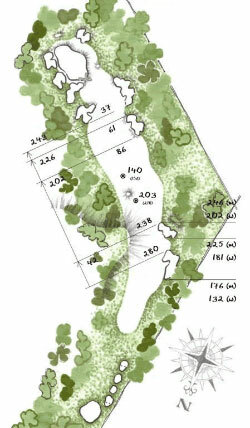 A pushed drive is likely to find the bunkers on the right of the dogleg approximately 220-240 metres from the white tee. The big (38 metres long) green plus the green surrounds short and to the right of it present a relatively large “hazard free” target zone for the really big hitter who wants to have a go at it. 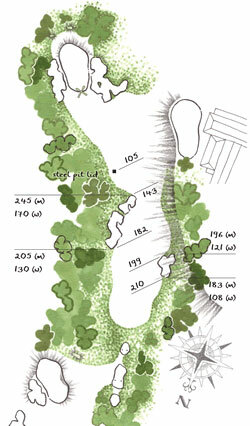 However, mis-cue and finish in the greenside bunkers or anywhere left or long and achieving par can become a struggle. 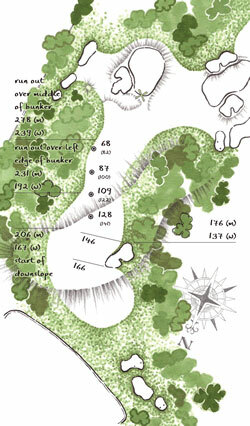 Arguably the toughest hole on the course with a tight dogleg right and an uphill approach. A driver over the corner of the fairway bunker to the left side of the fairway will leave a seven iron into a diabolically sloping green. A narrow fairway means a drive will often run through the fairway into the left hand side rough, resulting in a chip out to safety. 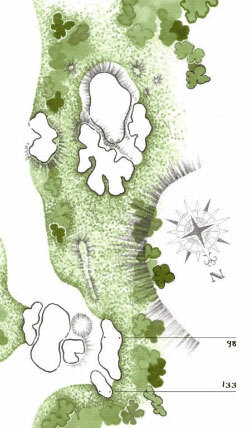 Strong southerly tail winds or northerly head winds can make judgement of the carry over the bunkers difficult. The player who can fade the ball into the right to left sloping green has a definite advantage and an uncontrolled draw will often finish in the left hand greenside bunker. The green is two-tiered and it is critical to hit the tier on which the pin is placed because the steep back to front and right to left slopes on this green create one of the most difficult long putts on the course. A par is always an acceptable score. The tee shot, particularly with a following northerly breeze, can bring into play the left hand fairway bunkers, which sit 262 metres from the white tee. A driver to the centre right of the fairway, avoiding the right fairway bunkers, will leave a long iron shot to a large, wide green which slopes from back to front. 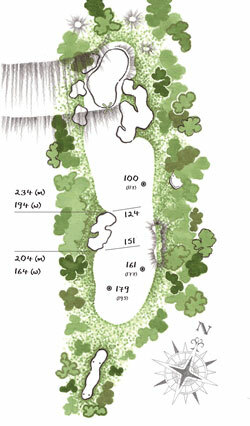 Nothing complicated about this hole – it just requires two long straight shots. 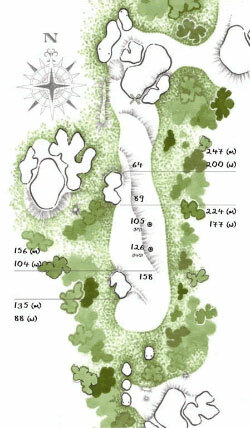 A short par 5 which is a definite birdie opportunity for the long hitter. To set up for the second shot to the green the drive should be hit up the right hand side of the fairway avoiding the fairway bunkers on the right (180 – 240 metres from the white tee). The left side of the fairway is guarded by native vegetation and is difficult to navigate. From the top of the hill a well hit three wood should just about get home if the angle of approach is right and the front left greenside bunkers are avoided. A kidney shaped green with some interesting slopes and a central ridge on the right should not present any major problems in getting down in two for a birdie. The main concern here for a long hitter may well be going through the back of the green and having to play a difficult downhill pitch and run, or chip, back to the pin. Another classic Sandbelt short par 4. A drive hit straight at the left hand side fairway bunker (224-247 metres from the white tee) but finishing short of it will set up an eight iron into a green which is angled to the right at 45° to the fairway line. The ability to fade a ball into this green takes out of play the front-right and back-left greenside bunkers and is particularly effective for the classic back centre pin placement. A drive to the right side of the fairway means a difficult shot across the narrow green which must be absolutely precise for distance if it is to avoid the bunkers in front and behind. Hole 15 is another classic Sandbelt par three. From the tee the green appears completely surrounded by fearsome looking bunkers with no way to hit the green other than to fly it all the way. Under benign conditions it probably requires no more than a well struck seven iron or an easy six iron depending on the pin placement but this hole can change significantly according to the wind strength and direction. While the bunkers may seem to present a formidable challenge they are infinitely preferable to the fate awaiting the tee shot that goes through the back of the green or misses badly to the left. One of Commonwealth’s most photographed and challenging holes. From the elevated tee the long hitter surveys a classic ‘risk versus reward’ challenge with the heroic carry over the corner of the lake presenting a real opportunity. The conservative player might hit a driver and a mid iron to this green whereas a successful shot over the corner of the lake might yield a nine iron pitch and a birdie opportunity. It might also yield a watery grave for the ball pulled or drawn a little too far left! The best value drive is left of centre towards to the edge of the lake (and not too long) for the best angle in to this green which slopes from right to left. The green presents a very difficult target from the wide open spaces of the right hand side of the fairway with the right hand green side bunker to be carried and a steep slope running off the left hand side of the green to carry away the ball which is long or played with a draw. The player who can draw a tee shot around the curve of the lake has a real advantage as has the player who can fade the shot into the green. Hole 17 is a great short drive and pitch hole. Yet another classic short par 4 with an accurate tee shot capable of setting up a birdie opportunity. The green slopes from left to right and has a large swale midway back on the right hand side so hitting and holding the green from the left of the fairway can be difficult. The best angle of approach is from the right hand edge of the fairway especially for a back pin placement and a draw can eliminate the possibility of running off the green to the right – an outcome which is frequently the fate of the shot hit with a fade. Length off the tee is of little consequence here and, depending upon the wind, many players may elect to hit a three wood or a rescue from the tee leaving a short iron pitch to the green. 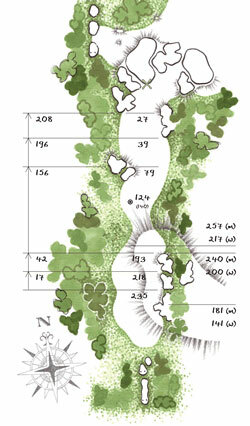 Depending upon the pin placement there can be a real problem for the player short-sided in the green side bunker, and going through the back of this elevated green generally leads to a five. This challenging final hole needs a driver to the left side of the fairway to set up the best angle for a mid-iron into the green. Driving accuracy is paramount here with a drive in the centre or to the right of the fairway resulting in a second shot that must carry some or all of the right hand greenside bunker. A pull to the left will finish in difficult rough or, in the worst case, in deep fairway bunkers where you may find it hard to reach the green in two.